Sparkling wine is defined as a wine which at 20ºC in a closed container has an excess carbon dioxide pressure greater than 3 bar. This excess pressure must originate exclusively from the secondary alcohol fermentation of a still base wine - after addition of the liqueur. Fermentation can take place only in the bottle or in a closed tank. 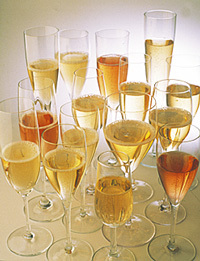 Use of carbon dioxide during counter-pressure transfer is authorised, provided that the carbon dioxide pressure in the sparkling wine is not increased. Article 7 of EEC regulation no. 358/79 states that member states must regulate the production and marketing of sparkling wines. All sparkling wine producers are required to declare their production to the competent authorities of the member state in which the wine was made. Producers are required to keep records on the grapes used and on winemaking techniques. a) No less than six months, when the secondary fermentation takes place in a closed tank. b) No less than nine months, when the secondary fermentation takes place in the bottle. The length of the secondary fermentation and the length of lees ageing are also specified.